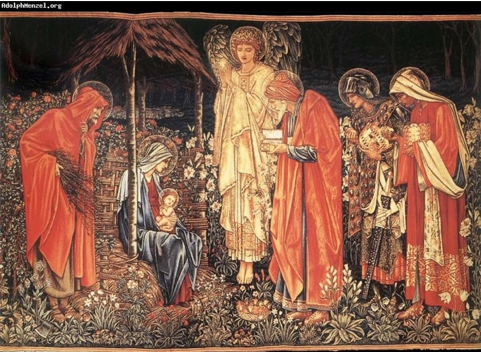 So, Herod tried to employ the Magi as spies –but they didn’t do it! There has been a great deal of speculation as to the actual identity of the three Magi as well as their origins. The most widely held view is that they were named Melchior, Caspar and Balthazar and they came from the ‘East”. That might be Persia as the word Magi has a Persian root. Another idea is that they came from somewhere around Yemen. I rather like that idea as Yemen had a large and influential Jewish population and, as we shall see, It is consistent with the character of the gifts that the Three Wise Men brought with them. And how about the gifts? Why exactly were these three things chosen by the Magi and what was their significance? The most obvious explanation is that gold, frankincense and myrrh were just very precious and that’s all there was to it. But there was probably much more to it than that. Let’s look into the matter a little further by examining each of the Three Wise Men and their gifts in turn. Melchior, is often depicted as having long white hair and a white beard wearing a gold cloak. Melchior gave the baby Jesus gold. Even today the gift of gold would be considered something that was fit for a king. Kingly associations aside, there are a very large number of reasons why gold would be an appropriate present. Gold was created at the birth of the universe through the collision of neutron stars. On our planet, gold is exceedingly rare. Most of the gold on the planet Earth is located in its core, but even there it makes up less than 1% of the total mass. The rest of the gold, which is accessible to us on the surface, was deposited on Earth through the collisions of meteors many millennia ago. Although widespread in nature, gold is exceedingly scarce, accounting for only 0.0000005 percent of the earth’s crust, compared to iron at about 5 and aluminum at about 8 per cent. An estimate of all of the gold ever mined by humans, which is probably more than half of the gold that is available to us, suggests that it is enough to fill about 3 and a half Olympic size swimming pools. Unlike many other metals, naturally occurring gold is usually found unalloyed as pure flecks or nuggets. Different cultures throughout the world have valued gold from time immemorial and it is easy to see why. First of all, there is the color of gold. Ancient peoples, the Egyptians for example, worshipped the life giving Sun. Gold has the color of the sun. If one could distill and concentrate sunlight then surely one would come up with gold. The alchemical symbol for gold is a symbol of the sun ,it is the concentrated essence of heat and fire. Then consider gold’s immutability. It is basically indestructible. Unlike silver or iron it doesn’t tarnish or rust. A gold ring can lie at the bottom of the ocean for thousands of years and still look as if it had just slipped from a lady’s finger-a fact that wasn’t lost on Richard Wagner and his celebrated Rheingold. Gold has heft –it is dense and heavy, twice as heavy as lead. Nevertheless, gold is fantastically malleable and ductile. One troy ounce (31.1 grams) can be beaten into a sheet (gold leaf) 300 square feet (about 30 square meters) in area, and it can be drawn into a wire 45 miles (72 kilometers) long. Gold, then, is beautiful, noble, rare and immutable, no wonder we value it so highly. Fig. 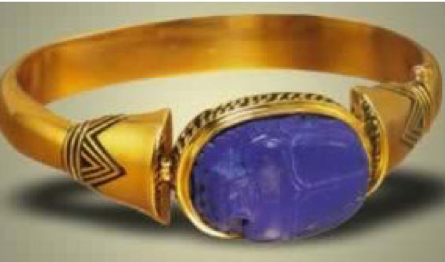 2 Egyptian 18 karat gold, lapis lazuli, and black enamel ring, 22nd Dynasty, reign of Shoshenq II, Tanis, c.890 BC. Of course it was the beauty and value of gold that made it the perfect material for making jewelry and ornaments in antiquity and, after thousands of years, nothing has changed. Since as early as 3500 BC in Mesopotamia gold has been used to make coins and, even today, its value still represents an absolute standard for trading purposes. A rich man owns gold or perhaps its equivalent-although, in truth, Bitcoins seem a lot less romantic. There are many stories which concern the consequences of owning gold. Ovid’s Metamorphosis tells us about King Midas who was granted a wish by the God Bacchus and asked that everything he touched should be changed into gold. Midas found to his distress that this really meant everything, including his food and his daughter. Distraught, he begged Bacchus to free him of his golden curse and was told he could do this by bathing in the river Pactolus. It appears that the river actually absorbed all of Midas’ golden excess. Years later it was found to be unusually rich in electrum, an alloy of gold and silver. The river flows through the city of Sardis the capital of Lydia in Turkey. The gold was rediscovered by Croesus who was king of Lydia from 560-541 BC and it became the basis of his great wealth. The great alchemists thought that gold was the most perfect substance produced by Nature. All other metals constantly tried to become gold and it was the task of the alchemist to help them to do this through a process of transmutation. The different metals were ranked according to their propensity to corrode as being nearer or further from gold-mercury being the next in line. The Egyptians thought that gold was a seed within other metals and could be activated allowing it to gradually eat silver or copper, for example, transforming them into gold. Alchemists devised an enormous number of procedures to achieve this kind of transformation. In many cases they were apparently successful. Disappointingly, today it seems difficult to repeat the successes of alchemy, raising the possibility that none of it was really true. But, then again, perhaps this is because alchemy is not just straightforward chemistry but also requires the alchemist to have the correct mindset –the metal and the alchemist must act simultaneously upon one another to achieve success. Developing the required state of mind may just be too much for a denizen of the 21st century. On the other hand, gold does have a part to play in our contemporary form of magic which we call medicine, something that can transform a sick person into a healthy one. Certainly, given that gold was a metal with such miraculous properties, it is not surprising that ancient peoples thought that it might be an aid to health and that it might have magical properties. The dramatic account of Moses burning the golden calf, preparing a potion from the ashes, and forcing the Children of Israel to “… drink of it” suggests this kind of thinking. The Taoist philosophers of ancient China circa 600 B.C. used gold and silver coatings on medications to hopefully enhance the quality of their potions. Through the centuries gold was suggested as a cure for all kinds of ailments by very reputable alchemically trained doctors including Avicenna, Roger Bacon and Paracelsus. It ultimately proved to be the case that, although gold is not a very reactive substance, it can be coaxed into chemical partnerships with other elements. First of all, it was discovered that aqua regia – a mixture of 20 % nitric acid and 80 % hydrochloric acid, was capable of dissolving elemental gold and that ultimately a variety of gold salts could be produced. Some of these did eventually find a place in modern medicine. In 1811 Andre Jean Chrestien and Pierre Figuier suggested the use of gold sodium chloride for the treatment of tuberculosis and syphilis. It was subsequently demonstrated that gold cyanide had bactericidal actions, further suggesting it could be used to treat tuberculosis. At the time it was thought that rheumatoid disease was due to an infectious agent and so, if gold salts were good for tuberculosis, they might also work for inflammatory rheumatoid arthritis. This subsequently proved to be the case, although today the reason why they work is not really clear. Drugs such as gold sodium thiomalate and Auranofin have been widely used for the treatment of rheumatoid arthritis since the 19th century and are still used today. It is unlikely that it was a use such as this that the Magi had in mind when they gave gold to the baby Jesus. But perhaps they were thinking of the future. They were very wise after all. Caspar was the second of the Magi. He is often portrayed as having brown hair and a beard wearing a green cloak and a gold crown with green jewels on it. He is sometimes referred to as the King of Sheba which is probably situated in present day Yemen or the Horn of Africa, something that fits with his choice of present for the baby Jesus which was frankincense. The gift of frankincense is supposed to represent “Deity” as it was burned in the Holy Temple in Jerusalem. Frankincense was also of great value at the time, by some accounts even more valuable than gold. But what exactly is frankincense? Frankincense is a gummy resin that can be extracted from certain trees. These trees belong to the Boswellia genus, a part of the Burseraceae family. The genus was named for John Boswell who was actually the uncle of the famous James Boswell who wrote the biography of Samuel Johnson. 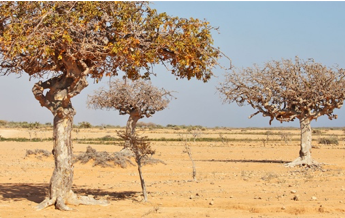 Boswellia trees grow in North East Africa as well as in Somalia, Oman, Yemen and India. 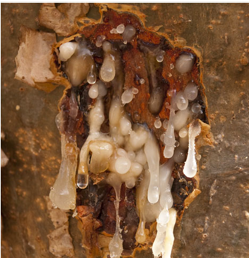 The exact quality of the resin obtained from a tree depends on the specific species concerned as well as its growing conditions. The species Boswellia Sacra grows extensively in Oman and Yemen and may well have been the source of the Magi’s gift. The trees grow mostly in the area of Dhofar on the border of Oman and Yemen. This is an interesting area because, although most of Arabia is a desert, a small corner of it is actually inundated with Monsoon rains from June to September and, it is near this area, where the Boswellia Sacra trees grow. Indeed, it is frankincense that comes from this area in particular that is thought to be of the highest quality being traditionally reserved for royalty. The trees are rather scrubby looking, growing up to some 20 feet tall with tangled branches, papery bark and striking white star shaped flowers. Frankincense resin is produced by ducts and is synthesized by the tree in response to injury, possibly representing a method through which the tree can seal up wounds. Indeed, the way that frankincense is harvested is to make a cut in the tree and to collect the gummy resin as it slowly drips out and hardens into “tears”. It is certainly a very labor intensive and costly process which presumably contributed to its great value in ancient times when it was considered very precious indeed. It was very actively traded by camel trains traveling across the arid Arabian dessert to many parts of the Mediterranean and beyond. 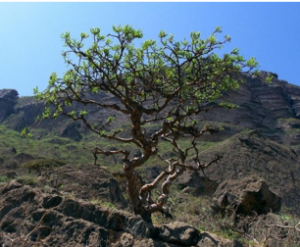 The same method for harvesting frankincense has been used for thousands of years during which time it has served both ceremonial and medical purposes. Frankincense is mentioned in the Ebers papyrus, an Egyptian medical scroll dating from at least 1500 BC. where it is included in a recipe for anti-wrinkle face cream. Amazingly it is still used in some cosmetics for this purpose today. Indeed, the Egyptians described frankincense as “the tears of the gods”. Generally speaking, from Biblical times through to the present day, there have been two main uses for frankincense. The first major use has been as an ingredient in incense because of its attractive perfumed fragrance. Frankincense is burned at celebratory events such as weddings or in religious ceremonies, to ward off evil spirits or promote a healthy environment, covering up unpleasant smells. The second major use has been as a medicine for treating all kinds of complaints. Some of the properties attributed to frankincense in ancient times were psychoactive. It was said to be able to “benumb the senses” and produce a tranquilizing anxiolytic effect, perhaps even being part of the drugged sponge given to Jesus during his crucifixion. Many other uses however attributed anti-inflammatory actions to frankincense and it was used in dressing wounds and bruises as well as for treating inflammatory bowel conditions such as Crohn’s disease. We might therefore wonder, from our 21st century perspective, whether frankincense really does produce these reported effects and, if so, what are the chemical components that are responsible for its actions? Modern medical investigations into the properties of frankincense have confirmed that it can produce anti-inflammatory effects, although the results are quite variable depending on the assay employed as well as the nature of the preparation used. This is particularly the case when using different crude extracts of frankincense. What then are the pure substances responsible for these effects? The first group of substances to be purified from frankincense are known as boswellic acids. A variety of experiments designed to examine the anti-inflammatory effects of these molecules confirmed that they were active but that they did not appear to account for all of the activities observed when crude extracts of frankincense were used, leading to the idea that there must be other important active components . A search for such materials demonstrated that another group of substances related to the molecule icensole also had marked anti-inflammatory activity. It is likely that the beneficial effects of crude frankincense extracts result from a combination of the effects of both classes of molecules. nerve, which sends this information to the higher centers of the cortex where is decoded as smell by our conscious brain. There are literally hundreds of odorant receptors that can detect volatile odorant molecules and the specific combination of receptors activated results in a unique odor. The volatile components of frankincense can be identified by examining its essential oil, a distillate that concentrates these substances. A recent investigation identified 23 major odorant molecules from frankincense .Prominent among these were ɑ-pinene, β-myrcene,linalool and p-cresol, which are generally thought to be responsible for the “rosiny and incense like” notes which are particularly marked in frankincense fragrance. Frankincense is still a popular choice for use in perfumes today. So, based on the fact that it is valuable, medically useful and smells great, frankincense was a good choice as a gift for baby Jesus. Again, like frankincense, myrrh is an aromatic resin that is obtained from a tree. This time the tree is known as Commiphora myrrha. It is a small scrub like tree which, like Boswellia Sacra, grows in North East Africa, the area around Oman and Yemen and into parts of India. This is something referred to in the Greek historian Herodotus (5th century BC): “Arabia is the only country which produces frankincense, myrrh, cassia and cinnamon…the trees bearing the frankincense are guarded by winged serpents of small size and various colors.” Like frankincense, myrrh is harvested from Commiphora myrrha by “tapping”-that is making a cut in the tree and letting the resin seep out and harden. These procedures are labor intensive and so myrrh was always rare and expensive. The uses of myrrh again parallel those of frankincense. Myrrh has been described as having a bitter and acrid taste and a balsamic odor. The resin was used in incense and perfumes and also as a medicine. The fragrance of myrrh is different from that of frankincense owing to the presence of a different set of volatile odorant molecules. Its most obvious perfume notes are woody, warm, aromatic, pungent and perhaps slightly medicinal. Certainly, the fragrance of myrrh has retained its popularity with the most upmarket of today’s perfumers. ”No 10 Myrrh” is marketed by Prada and “Myrrhe Imperiale” by Georgio Armani. The myrrh note is apparently best used in oriental fragrances. “Myrrhiad” by perfumer Pierre Guillaume is said to use three more notes to complement myrrh; these being licorice, vanilla and black tea absolute- who could resist? Analysis of the essential oil of myrrh distilled from the resin has revealed a large number of volatile odorants including ɑ-pinene, cadinene, limonene, cumin aldehyde, eugenol, cresol, heerabolene, acetic acid, formic acid, and several sesquiterpenes. Myrrh has been used for an enormous number of medical indications including indigestion, ulcers, colds, cough, asthma, lung congestion, arthritis pain, cancer, leprosy, spasms, and syphilis. It is also used as a stimulant and to increase menstrual flow. Myrrh can be applied directly to the mouth for soreness and swelling, inflamed gums (gingivitis), loose teeth, canker sores, bad breath, and chapped lips. It is also used topically for hemorrhoids, bedsores, wounds, abrasions, and boils. Several other members of the Commiphora genus also produce medically important products including Commiphora Mukkul, known as Guggul, which has had an important place in Ayurvedic medicine for many years. It will be clear that the Magi chose wisely when selecting gifts for the baby Jesus. The gifts were precious and valuable. 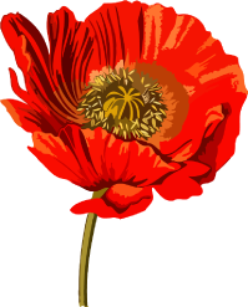 However, they all also had important pharmacological properties which would have helped the baby and his family fend off any disease. Finally, everybody would have smelled fabulous. Come to think of it, a piece of gold jewelry and a bottle of frankincense or myrrh based scent would be a great gift for the king or queen in your life as well.